112. An Alternative COMPETITION! Win JJ Massa’s book ~ Eye Candy! Leave a Comment on 112. An Alternative COMPETITION! Win JJ Massa’s book ~ Eye Candy! 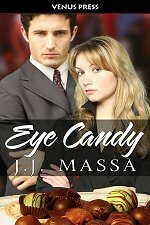 Author of sensual romance, JJ Massa, is offering a copy of the book Eye Candy as a prize for the winner of this competition. To be in with the chance to WIN a copy of her book Eye Candy — ANSWER THIS ONE QUESTION: Three of the four main characters share a profession. what is it? This competition closes November 22 — Cosmo’s birthday!